Cisco 7985G IP video phone (CP-7985G) is a personal desktop video phone for the Cisco Unified Communications solution. 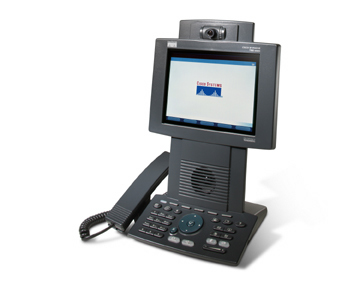 Offering executives and managers a productivity-enhancing tool that makes instant, face-to-face communication possible from their offices, the Cisco Unified IP Phone 7985G has all the components to enable a video call-camera, LCD screen, speaker, keypad, and a handset-incorporated into one easy-to-use unit. Using the Cisco Unified IP Phone 7985G, a video call is just a phone call. The Cisco 7985G Unified IP Phone is a dynamic device designed to grow with your system capabilities. Call features such as call forwarding, transfer, conferencing, and hold are now available with video and are all initiated through the IP phone. Using Cisco Unified Communications Manager, IP telephony and IP video telephony are delivered to every employee using a unified dial plan and a common directory, over a single Cisco Unified Communications solution infrastructure. Through software updates to the Cisco 7985G IP video phone flash memory, features keep pace with changes. No manual configuration of the phone is required when the user changes location; the user simply picks up the phone and moves to the new location anywhere on the network. The Cisco Unified IP Phone 7985G provides many access methods according to user preference. In addition to the Messages, Directories, Settings, and Services buttons, the Cisco Unified IP Phone 7985G has five buttons to control display features.